Who is that mysterious woman? One minute she looks nine months pregnant with a odd sort of antenna extending from her all-too-tall red beehive? The next she's looking decidedly out of place in a strip joint dressed as a nun. A better question for Charlie is--just why does she seem to turn up everywhere he is? It's almost as if she were following him. And Charlie just doesn't need the kind of distractions this mysterious woman creates as he races to save his family's legacy. 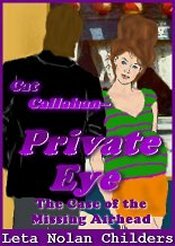 When Cat Callahan takes on her first big case for the private investigation firm she inherited from her father, she's got more than dad's reputation to live up to--she needs to solve this case to keep the agency in business. Dad was a great P.I. but a lousy businessman. The Simpson diamond collection has disappeared right along with Amber Taylor--vanished without a trace. The only clue to its whereabouts is shady businessman Lamont Lewis--a dark man with darker secrets, who vowed to possess it and Amber. Yet, every time Cat gets close to Lamont this incredibly gorgeous guy seems to get in the way. Is he one of Lewis' henchmen? Or an innocent bystander who simply creates not-so-innocent fantasies for Cat? It requires a special talent to write comedy, and Leta Nolan Childers has enough for two people. Cat Callahan is a fiery, determined heroine in the spirit of Carole Lombard and Roz Russell who not only rushes in where angels fear to tread but follows a few paths demons might think twice about. She is at once sharply intelligent and amazingly naive, driven by rose-colored images of those she loves to leap when she should tiptoe. Charlie Hillinger is the perfect foil, and the witty dialogue between these two is an unending delight that definitely brings to mind The Thin Man.. Yet Ms. Childers never loses the story, supplying plenty of action and suspense to balance the repartee. She is also wise enough to avoid making her villain a total monster, instead using him as a means of awakening Cat to a reality she would have preferred to ignore. There are no cartoon characters here. Ms. Childers takes what could be stereotypes and gives them just enough depth to make them real, believable people. what else? Everlasting love. I adored it! M. D. Benoit, author of 'Til the Fat Lady Sings, from Pulsar Books.